Valuable Lumber from your logs! Boards, Beams & Natural Edge Slabs from Logs Large and Small! Terrific Timbers LLC will saw your logs into lumber, at your property. TTLLC is a portable sawmill service. I cut your logs and leave you with boards, scraps, and sawdust. TTLLC's customers have been home, land and estate owners, woodworkers, contractors, farmers, timber framers, hobbyists, municipalities, nonprofits and businesses. PLEASE NOTE: TTLLC does not cut down trees, buy logs, or sell lumber. Different Sawmills, Different Ways to Saw even the Largest Logs. Wood-Mizer LT-40 Super Hydraulic Bandsaw. High volume, high yield sawing of logs up to 36" diameter, 4400 pounds, 20-1/2 feet long, and boards to 26" wide. Powerful 42HP diesel engine and two hydraulic pumps, for fast accurate sawing in all woods. My workhorse. 18+ years' experience operating, over 1,100,000 board feet sawn. Peterson Wide Slabbing Sawmill. Wide slabs best retain the natural beauty and history of a big, old tree. 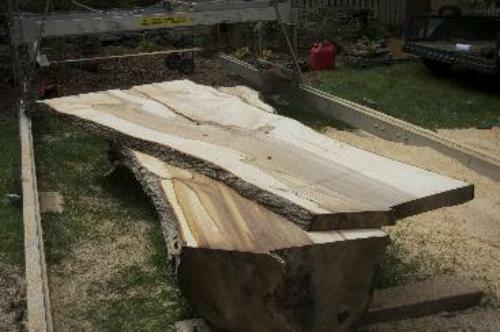 Natural edge slabs to 60" wide, logs to 5 feet diameter. Peterson Swing Mill with Circular Blade. 26" diameter circular blade cuts boards up to 10" wide, from logs up to 5 feet diameter and 33 feet long. Efficient sawing of quartersawn boards and beams from heavier and longer logs. Terrific Timbers LLC welcomes both large and small jobs. Please call or e-mail Dennis with details about your logs and for a free estimate. Phone 860-235-4504, email dennis@terrifictimbers.com. Terrific Timbers LLC is located in Mystic, CT. Sawing throughout CT. All inquiries are welcome and will be answered promptly. TERRIFIC TIMBERS LLC carries business liability insurance. Measure twice (or more) before cutting this walnut log!!! 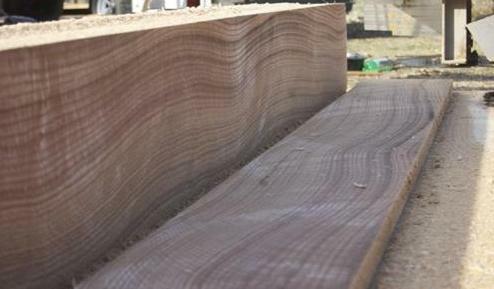 The walnut crotch slab, below, was sawn from a Y=shaped crotch section about 4 feet wide. The Peterson mill with its chain slabber attachment will accurately and efficiently saw slabs like these. Terrific Timbers!! Freshly sawn walnut is green in color, and turns the familiar brown-purple in a few minutes after being exposed to air. You can see the green color fading away in this crotch board. Again, your inquiry is most welcome. Contact Dennis at 860-235-4504 or by email.